5 p.m. to 5:45 p.m. 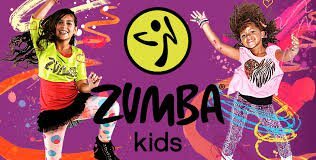 In partnership with Studio Fitness, we are excited to offer Zumba Kids Jr classes! Zumba® Kids Jr classes are 45 minute, rockin’, high-energy dance parties packed with kid-friendly routines. We break down steps, add games, activities and cultural exploration elements into the class structure. Develop a healthy lifestyle and incorporate fitness as a natural part of your family’s life – Yes, parents and caretakers can participate in the class too! Classes incorporate key childhood development elements such as leadership, respect, team work, confidence, self-esteem, memory, creativity, coordination, balance, and cultural awareness. Recommended for ages 2 and up. Classes are $5 per child (adults are free). When registering, only include children in your group size – you do not need to include the adults who will attend. You can register online here or call 417-202-2025 to sign up.